A night when even the Kazimier’s light fittings were dancing, as Sean Kuti brings the afroparty to Liverpool. 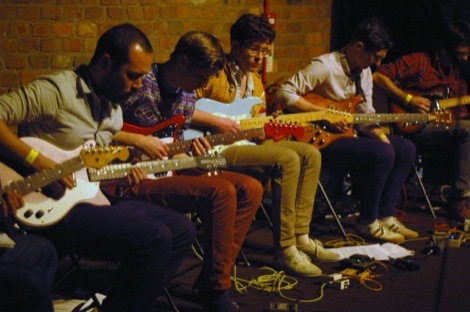 Getintothis’ Sean Bradbury on one of 2011’s finest moments. It’s a good feeling to go to a gig and know every chord strummed and every lyric sung ahead of schedule; to indulge in an evening of auditory nostalgia and placate the natural need of listening to what you know you like. But nothing compares to being completely blown away by new music. So it proved at Obscenic‘s showcase at the Kazimier on Thursday, as three acts in succession defied belief and brought the house down to an ever-increasing level of decibels. 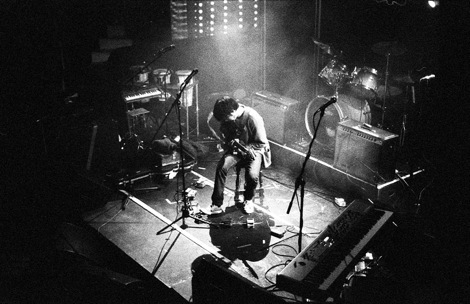 Dustin Wong was first up. Initially the lone Baltimore guitarist cut a timid figure, surrounded by a plethora of pedals with only his black and yellow Telecaster to prove himself to a venue that was sceptical in its sparseness not long after the doors had opened. 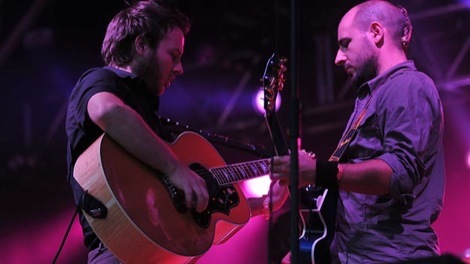 It soon became obvious that this was to be no mere support act, but a sonic symphony. The blueprint for each of his tunes was similar but produced very different results: a riff plucked, picked or tapped – then looped and built upon. 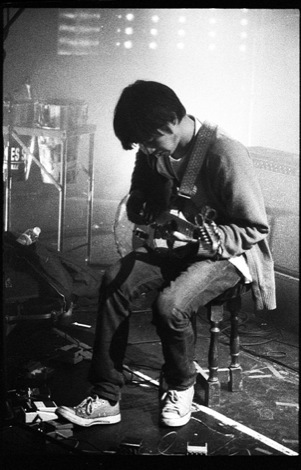 A few bars and layers later he was five men with ten arms, utterly in command of a waterfall of guitar lines and hypnotic drones washing over the room. The total effect sounded at once like M83, later like Four Tet and somewhere down the line like Dream Theater – with a million and one musical references in between. Next on the bill were United Vibrations. 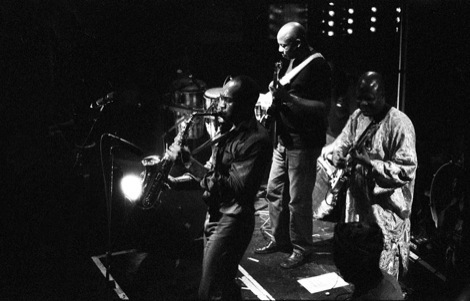 The London foursome emerged declaring, ‘We’re gonna try and warm you up for Seun Kuti‘. By the end of opener Return To Forever they had done much more than that – cranking up the temperature and volume, drawing the crowd nearer to the stage and setting off an infectious skank. 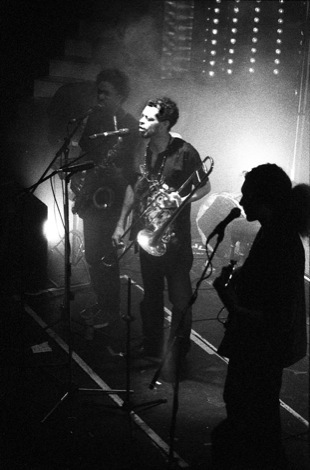 Their combination of drums, sax, trombone and bass – with a sprinkling of swirling keys every now and then – allied to a distillation of genres as diverse as jazz, reggae, funk and DnB, came together to form an irresistible fusion assault. Huge low-end grooves anchored free-spirited experimentation from the other instruments, recalling John Coltrane, Sun Ra and Jimi Hendrix, with anyone capable of taking the leading and directing the sound into uncharted territory. Highlights included the band’s first official release Ra!, as well as closer No Space No Time with its triumphant refrain of ‘there’s only here, there’s only now‘ summing up how everyone present was feeling at that moment. I could have gone home happy then, but what lay in store was perhaps the biggest coup the Kazimier has pulled off to date. The appearance of Seun Kuti, son of legendary Afrobeat pioneer and activist Fela Kuti, in such an intimate setting was not just an improbable booking but a logistical challenge. 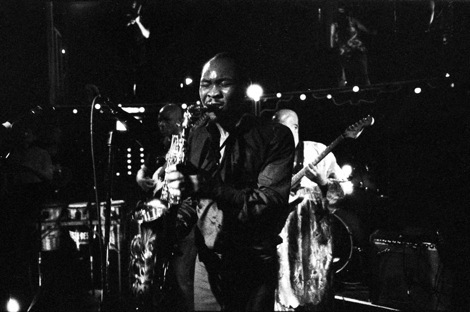 Every inch of the two-storey Kazimier stage was covered as the 15-piece Egypt 80, ages ranging between 30 and 70, plugged in, tuned up and started jamming before their leader was introduced as ‘the young African musician with fury in his pedigree..
Seun Kuti and Egypt 80. His spectacular set gathered more momentum as Slave Master, Rise, Mr Big Thief – songs from his new album From Africa With Fury: Rise – were belted out in blistering fashion. With his powerful stage presence, sharp political conscience and above all his beguiling, unifying joy of music, Seun is dancing in his father’s footsteps – and he left a delighted Kazimier moving to the same beat.